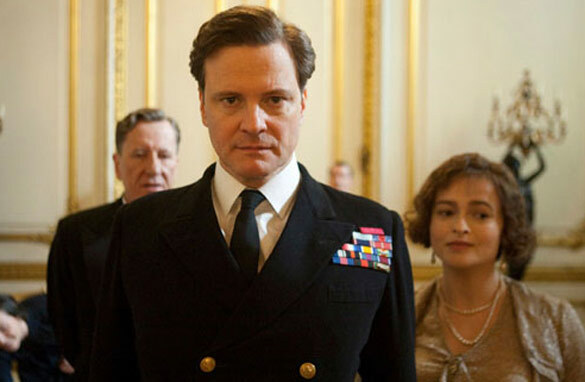 The film, 'The Kings Speech,' has already been nominated for countless awards and its leading man, Colin Firth, has won a Golden Globe for his portrayal of King George VI. The movie follows the story of the king while he struggles with a harsh speech impediment during his reign and also stars Geoffrey Rush as speech therapist Lionel Logue. One of the film's producer, Iain Canning is ready to answer your questions about the film. From the issues of bullying to the story of enduring friendship between two men. Please leave your questions for Canning below and be sure to include where you're writing from. What influence does the royal family have on films about them? Are you free to make these films whether you have their permission or not? Did you face any unique challenges producing this film? During the entire process, did you always have a sense that this film would be a masterpiece? How did the casting of Helen Bonham carter happen? She's brilliant in the film but I never would have thought of having her initially. When George VI practises his Coronation Oath, he lists the Dominions, but excludes the Union of South Africa, which was also a Dominion, and is in the Coronation Oath. Why was this done? The use of Beethoven's Seventh Symphony is masterful – foretelling in music what inevitably lies ahead at the same time it says in retrospect, how could the German people have fallen under Hitler's spell. How did you decide on the composer and the approach (i.e, no Elgar, Holst, or other immediately recognizable British composer. The film ranks, for me, with Chariots of Fire and A Man Called Peter (Richard Todd, 1955) as the best movies ever made. You should write a book (or video) about "The Making of "The King's Speech)!! As we're creature of God,do you mind if we get in touch ...? I just want to know, who is in the portrait at David's house?